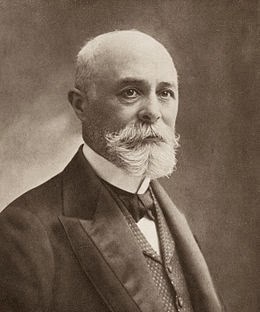 Henri Becquerel was born on December 15, 1852 in Paris, France. He was born into a family of scientists. His grandfather, Antoine Cesar Becquerel, invented an electrolytic method for extracting metals from their ores and his father, Alexander Edmund Becquerel, a professor of applied physics was known for his work on solar radiation and phosphorescence. Becquerel attended the Ecole Polytechnique in 1872 and the Ecole des Pontes at Chaussees from 1874 to 1877 where he studied engineering. After graduation he worked as a engineer for the Department of Bridges and Highways. In 1876 he became an assistant teacher at the Ecole Polytechnique. In 1895 he became the chair of physics. He also worked as an assistant naturalist at the Museum of Natural History. When his father died in 1891 he assumed his position as the professor of physics at Museum of Natural History. Becquerel's research covered a number of physics topics. His first work was the rotation of polarized light rays using magnets. Next he began researching phosphorescent materials following in the footsteps of his father. He studied phosphorescent materials by exposing them to sunlight and then exposing them to photographic plates. He was conducting an experiment with uranium. First he would expose it to sunlight and them place it in with a photographic plate. He noticed that the uranium fogged the picture produced. He found he could block the fogging by inserting coins between the uranium and the photographic plate. An experiment run on February 27 and 28, 1896. The weather was overcast when he exposed his uranium salts and so he expected only a faint fogging on the developed photographic plate. Instead he was surprised to find the fogging as severe as it would be from uranium exposed to the sun. This radiation produced by the uranium did not need to be illuminated with sunlight to be produced. The new rays that were produced by the uranium were named Becquerel rays. Becquerel determined that the rays ionized gasses and could be bent by a magnetic field, unlike x-rays which had recently been discovered by Wilhelm Rontgen. Becquerel determined that the particles emitted by the uranium salts were identical to the electrons discovered by Joseph John Thomson. Becquerel named the particles beta particles. For his discovery of spontaneous radioactivity Becquerel shared the 1903 Nobel Prize in physics with Marie and Pierre Curie. Becquerel had given the breakdown products of his uranium salts to the Curies, who discovered polonium and radium in them. Other honors won by Becquerel include election to French Academy of Sciences in 1889. He was made an officer in the Legion of Honor in 1900. Becquerel died on August 25, 1908.